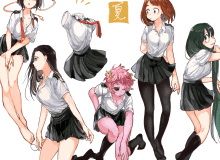 Witch Boku no Hero female character are you? Hello. This is a quiz about Boku no Hero Academia. If you answer honestly, you will find out who you would be in the anime, ye (including all girls of class 1-A, plus Mei, Nejire-chan and Itsuka). Have fun. What's up? Did you like the result? So... this quiz was done by a non-American girl, so sorry for any misspellings. Uh... it's just that, I think. Jirou is best girl, bye. Select one of the following personality features that describes you the best. What is your biggest defect? Choose a phrase that suits you the most. Let's see the positive side. We have to think about this calmly. How about we have a party or something? There's no time to hesitate, so do it now. We've got to start at the bottom and work up. Hey, hey. Want to see something cool? Do you usually demonstrate your emotions/the things you like? My tastes, yes. But my emotions, I see no need. How is your performance at school? I don't study too much, but I get along well. Uh ... ehehe, I'm horrible in most matters. I do my best to have satisfactory grades! Witch of these you dislike the most? Witch animal you would be? Quiz topic: Witch Boku no Hero female character am I?